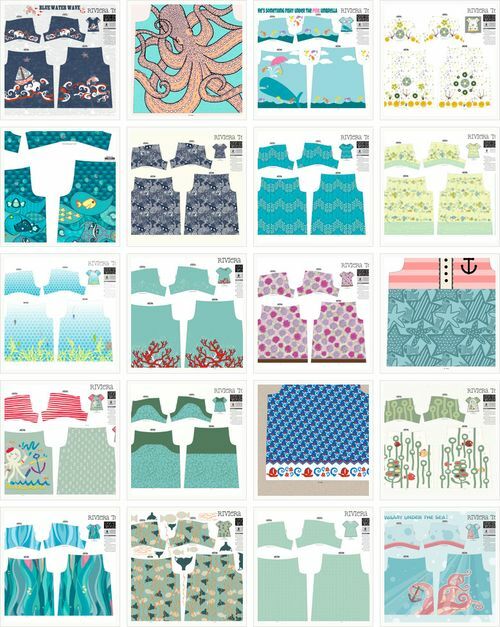 Despite the risk of wearing you out with ocean motifs, our contest theme this week is a tribute to the sea creature most of us love to look at but hate to bump into: the jellyfish. Can’t you see these prints going over well on a pair of boxer shorts? This week we resurrected a variation on a popular but difficult theme from one of our fall contests: ditsy prints. Ditsy refers to very small prints designed to scatter rather than to repeat in an obviously symmetrical way. Ditsy prints are popular for apparel sewing. Deciding which of the contest entries best capture the idea of ditsy through the use of sea critters is the mission before you today, should you choose to accept it.